estimate (something) to be better, larger, or more important than it really is. Low maintenance girls with a High maintenance blog. Hi guys! I shared about this on Facebook, and my Aunt suggested I should start a blog! So, lets give this a shot! Let’s be honest, my photos leave a lot to be desired, but maybe I’ll get better! Since January 1st, I’ve been trying to stick to my New Years resolution! It may sound totally silly because its not completely life altering, however, I’ve actually noticed a difference in my day to day life because of it! What was my resolution, you ask? I resolved to use only my cook books to cook from for the entire year instead of scouring the internet for some disappointing recipe! I LOVE to cook, so for many years now, I have been collecting cookbooks! If you’re ever in the mood to buy me a present, ask my friends and family, a cookbook is the way to go! They are a pain to move every time I decide to relocate (which is a lot), but I love them! They bring me joy. They are really the only kind of books that I really get in to reading! Weird, I know, but you’d be surprised what you can learn from reading a cookbook! The week before Christmas, my husband and I decided to have a little Christmas celebration of our own before we left town to celebrate with my family in Arkansas! Of course, the first thing I thought of was, “What fun meal can I cook?!”. Since we would be leaving the next day, I wanted to make something without a ton of leftovers, so I had a little challenge ahead of me. My friend Jessica Seymour had just given me The Magnolia Table cookbook and I had heard rave reviews, so I opened that puppy up and put together our miniature Christmas feast! 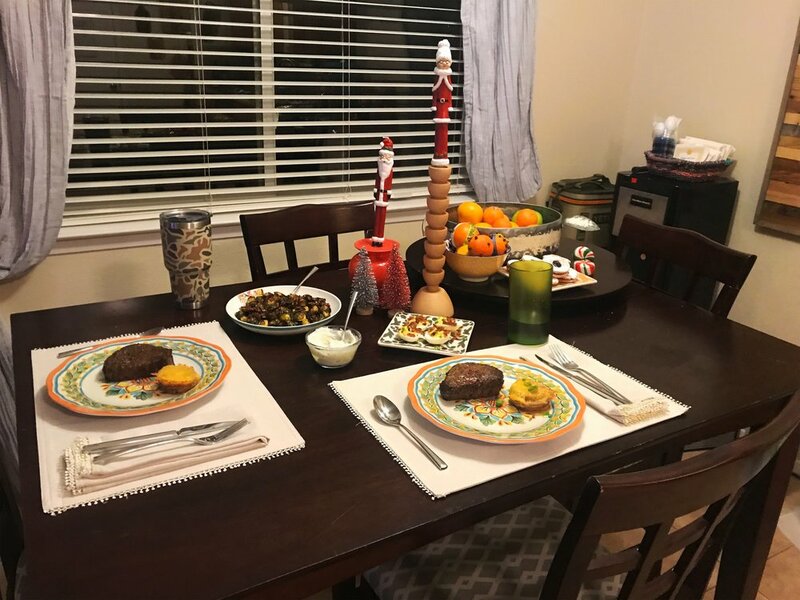 Out of her cookbook, I decided to make her “Beef Tenderloin with Pickled Jalapeño Sour Cream”, “Potato Gratin Mini Stacks”, and “Brussels sprouts with Chrispy Bacon, Toasted Pecans and Balsamic Reduction”. I also made my mom’s Deviled Eggs and added bacon on top and a really simple dessert of Blue Bell’s Peppermint Bark ice cream with chocolate shell. I decided to do the Beef Tenderloin, because I found out that you can actually have the butcher cut you a couple of little pieces so you have just what you need! Revolutionary for me though this is probably common knowledge! Because I have a small allergy to jalapeños (I think), I replaced the jalapeños in the recipe with jarred banana peppers. I basically halved the marinade recipe and then followed the recipe exactly. I did the same thing with the Jalapeño Sour Cream and used banana peppers instead. You guys… this tenderloin!!! It’s insane! Sean and I both agreed that it was the best we had ever had! Soooo flavorful and SO easy! For the Potato Gratin Mini Stacks, I went ahead and made the entire recipe because I discovered that they actually freeze pretty well! I followed this recipe exactly and it was awesome! The Brussels sprouts were pretty straight forward, and I simply halved the recipe so we wouldn’t have a ton of leftovers. These were really great as well, but in my opinion, there were a few too many pecans in the recipe. If you make it, maybe cut them down a bit unless you REALLY love pecans! I also tend to eyeball measurements so this may have been my own doing! My mom’s deviled eggs recipe isn’t exactly a recipe, again I’m an eyeballer. I just hardboiled two eggs in my idol’s (Ina Garten) foolproof method! Put the eggs in a pan, fill the pan with cold or room temp water, bring it to a boil over high heat, and as soon as the water comes to a boil, slap a lid on the pan and turn the heat off. Set a timer for 15 minutes for perfect hardboiled eggs without the weird grey stuff! When the timer goes off, move the eggs to a bowl of ice water for a few minutes and then peel them! Easy cheesy! To make the deviled eggs, cut the eggs in half, scoop out the yolks into a bowl, add some mayonnaise, mustard, sweet relish, salt and pepper and mix it up. Adjust until it tastes good to you! For my little addition, I crumbled crispy bacon on top and OMG! Thats good stuff right there! So, that’s it! This is how I got my idea for my New Years resolution! This meal was amazing and I loved the fact that I wasn’t running back and forth to my phone trying to look at a recipe when my phone keeps going to sleep! I look at it this way, if someone took enough time to test recipes that they were confident were good enough that they would sell in a cookbook, they must be good! What do you think of this resolution? Want to jump on board with me? !